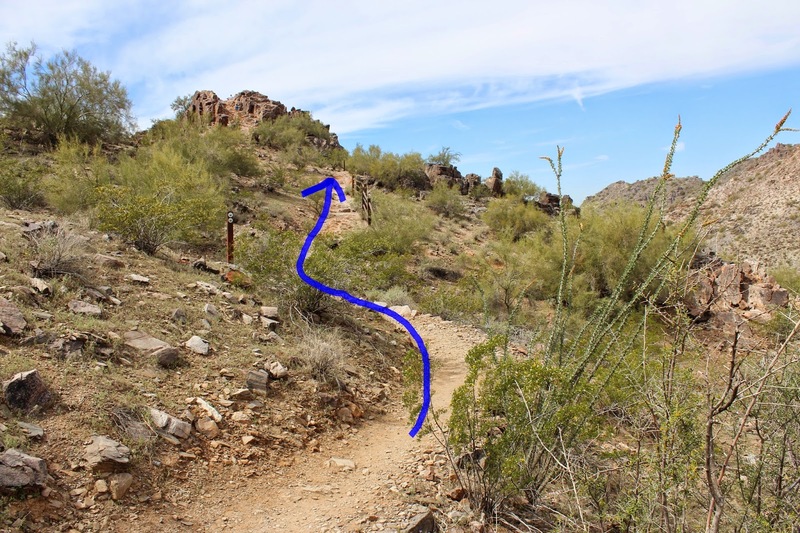 The Mojave Trail is located in the Dreamy Draw and Piestewa Peak area of the Phoenix Mountains Park in Phoenix, Arizona. The trail begins at a parking area across the road from Piestewa Peak. The Mojave Trail by itself was originally only about a half mile long. It appears to have been extended when the park was expanded to include more of the surrounding area. 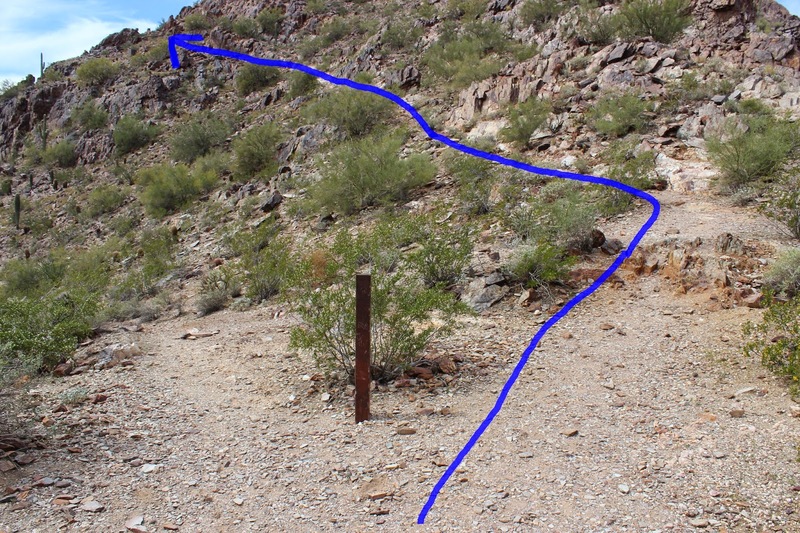 This post makes use of a connecting route that leads down to the main entrance and Squaw Peak Drive to form a 1.7 mile loop. Depending on where you can find a place to park your distance may vary. The entrance for the Piestewa Peak area is located at 2701 E. Squaw Peak Drive. Kiosks at each of the parking areas have maps that show the various trails and how they all interconnect. 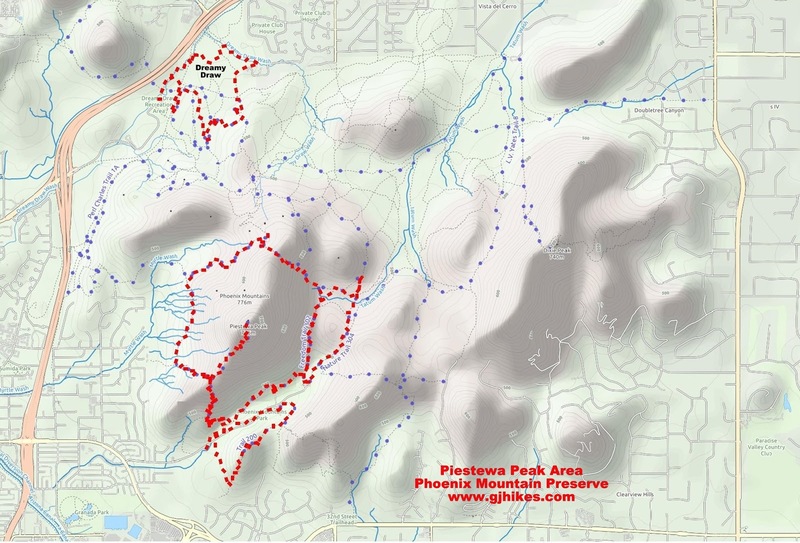 You can also print out a map from City of Phoenix's website to carry with you while you hike. The Mojave trailhead is the first parking area on the right as you drive into the area. Popularity of the trails when outside temperatures are more suitable for hiking necessitates that you arrive very early on weekends and holidays to find a place to park or wait until later in the day when others have left. The trail begins on the north side of the Mojave parking area and heads east from there. After a short distance the trail bends more to the south and begins climbing at a moderate slope. This photo is of a gamble quail that was calling out to its covey of friends and then waiting for a response. This one is a male so maybe it was trying to court a companion. Just under the half mile point the trail comes to a junction where the Mohave Connector trail branches off on the left. Older maps show this as being close to the boundary of the Phoenix Mountain Preserve but the park has been expanded in more recent times. Following the branch of the trail to the right will lead to more Mojave 200 trail markers. The trail traverses around the west side of a small prominence where it continues to climb toward a higher peak. Stay to the right as you cross the saddle below the peak and find the trail that angles up the mountain. We found several chuckwalla lizards that were providing the entertainment while hiking this section of the trail. At the time of this post the trail marker in this photo was the last indication of an official trail. Continuing past the last marker though reveals more trail that descends the opposite side of the mountain. This section of trail is a little steeper but there are switchbacks that lessen the impact. We followed it down to the bottom and went to the right on a trail that connected to the parking area at the parks entrance where we followed the trails along Squaw Peak Drive back to our vehicle. Squaw Peak Drive is a gated road that is open between 5 am and 7 pm. The trails are all open until 11 pm if by chance you are beginning from somewhere outside the gate. Of the half dozen or so trails in the immediate area the Mojave Trail receives fewer hikers than most and almost none compared to the ever so popular Summit Trail. If you would like to see it for yourself then all you have to do is 'Take a hike'.